Custom manufacturing doesn’t have to come with custom-made problems. Our in-house manufacturing capacity and state-of-the-art capabilities means we can produce quantity runs of custom fiberglass or aluminum signs that are accurate and consistent, as well as unique and out-of-the-box. When your image is on the line, exacting standards and superior materials make the difference. That’s why ImageFirst™ is trusted everywhere from the humble shop around the corner to professional football’s biggest event. 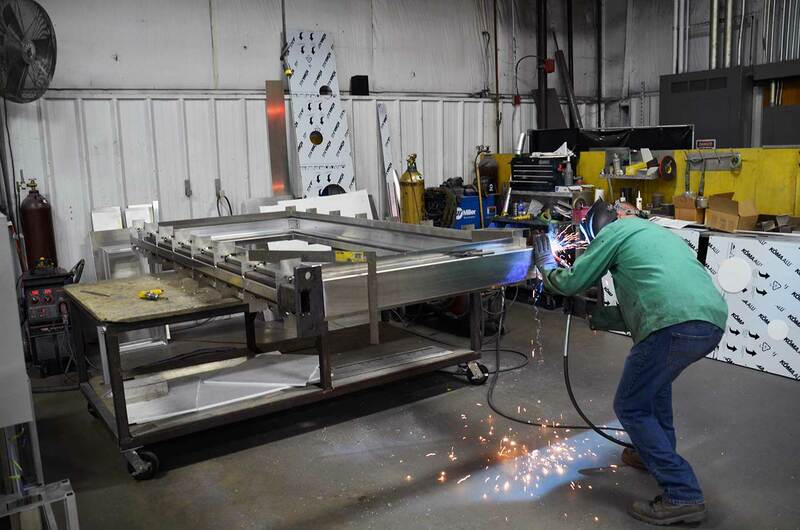 Our experienced fabricators are certified welders and specialize in custom-shaped cabinets, faces, pole covers, shrouds, reveals, trims, and architectural design elements that are beyond most sign manufacturers. From the moment an engineer picks up a sketchpad to the instant the last rugged component is secured, ImageFirst ensures your sign is built to stand the test of time. The manufacturing process starts with CNC-controlled computerized techniques to ensure the best fit and finish, and continues with brand-name materials and components. All signs are then treated with a light acid wash and mechanically disc-sanded before priming and painting, for the best adhesion and consistent coverage. We use several automotive-grade polyurethane paint coatings and can create custom colors or processes. With our UL listed status, all products go through a final testing process to ensure they will illuminate far above industry standards.